Named for Ben Franklin, this plant is now extinct in the wild. It has similar characteristics to it's cousin the Camellia. Camellia is but one genus of about 30 genera in the family Theaceae. The tea family, as the Theaceae is commonly known, took its name from the first named genus, Thea. And Thea is the former generic name for the plant which is the source of the beverage tea. Both the scientific name and the common name are derived from the Chinese name for the plant. Now a day, taxonomists have merged the genus Thea with the genus Camellia, leaving Thea a defunct genus. But it did NOT leave the genus Camellia without other relatives. The other genera in the Tea family that are known to and grown by gardeners to some extent in the west are Stewartia (Stuartia) with 15 to 20 species, Franklinia with one species, Cleyera, about 17 species, Ternstroemia about 85 species, Eurya about 70 species and Schima with from 1 to 15 species. A number of more obscure genera are: Apterosperma and Euryodendron in Southern China; Archboldiodendron in New Guinea; Dankia in Vietnam and Visnea in Canary Islands. These last five are of very limited natural distribution. Stewartia might be the showiest and most widely grown genus in the tea family after Camellia. They are grown as much for their showy white camellia-like flowers as for their colorful bark. They also generally have excellent fall color. Many species are much more cold tolerant than camellias so they can be grown in areas where camellias would not survive. Stewartia malacodendron and S. ovata are the two species native to the US. Stewartia malacodendron is known as the Silky Stewartia. It has 4” wide white flowers. The stamens have purple filaments supporting blue anthers. Its foliage generally colors up orange and red in the fall. It is native to the SE US and is hardy in zones 7 to 9. Stewartia ovata goes by two names; Mountain Stewartia and Summer Dogwood. Its first name recognizes its home in the Southern Appalachian Mountains where it is most common. Summer Dogwood notes both its resemblance to the flowering dogwood, Cornus florida, and its time of bloom, which is another asset of the genus Stewartia, that they bloom when few other trees or shrubs are blooming. It is usually less than twenty feet tall and more often of a multi-stemmed shrub-like habit than a single trunked tree. It is hardy in zones 5 to 8. Three Asian species that are often cultivated are S. pseudocamellia, S. monadelpha and S. sinensis. All have showy displays of white flowers. With age S. pseudocamellia, the Japanese Camellia, develops highly ornamental peeling bark of red brown, grey and pink. 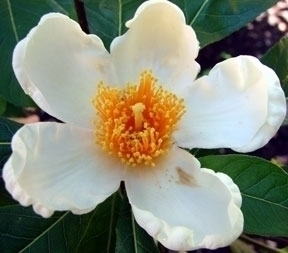 Franklinia has a most interesting history. It was discovered by America’s first native botanists, the father and son team of William and John Bartram. In 1765 the Bartrams found a small population of trees along the Altamaha River in southern Georgia. Several years later William Bartram returned and collected seeds. The species has never again been seen in the wild and all existing plants are descended from this collected seed and now, generations of its offspring. They named the genus after their friend, Benjamin Franklin. Despite being extinct in the wild it is widely grown in gardens for its 3” wide white flower which are produced in summer and its glorious fall color, usually scarlet and crimson. Gordonia is yet another genus in the tea family with flowers that closely resemble single white camellias with their large central boss of yellow stamens. The genus is now considered a strictly New World one, now that the Asian species have been moved to the genus Polyspora. Molecular analysis indicated that the two genera, though physically similar, are not closely related. Both genera consist of evergreen trees and shrubs, primarily of moist forests. The Polyspora number about 40. Gordonia lasianthus, the Loblolly Bay, is the one species native to the United States. It occurs in the Southeastern coastal plain. It closely resembles an evergreen Franklinia. It is growing quite successfully in the Massee Lane Gardens of the American Camellia Society in Fort Valley, GA.
Gordonia fruticosa is native to tropical rain forests of Central and South America from Costa Rica to and including Brazil. Polyspora axillaris has the common name of Fried Egg Tree, so named for its 9mm wide white flower with its orange-yellow central boss of stamens. The status of the genus Schima is typical of so much of the flora of China. The experts’ determination ranges from fifteen distinct species to one variable species, Schima wallichii. Whether one or fifteen, Schima occurs over a wide area of subtropical to warm-temperate regions of Asia, from Nepal and India, eastward to Taiwan. It is an evergreen tree with ¾” white flowers with the typical boss of yellow stamens in the center. It can grow to over 100 feet, though more often it is quite a bit less. It is growing successfully in the Massee Lane Gardens of the American Camellia Society in Fort Valley, GA.
Three additional genera in the tea family that are often grown as ornamentals in gardens are Cleyera, Ternstroemia and Eurya. All three find favor more for their handsome evergreen foliage than their flowers, which are small in Cleyera and Ternstroemia and inconspicuous in Eurya. For years Cleyera japonica was mistakenly grown and sold in the nursery trade under the name Ternstroemia japonica. Cleyera consists of about 17 species of usually evergreen, occasionally deciduous, trees and shrubs in the Himalayas to Japan and in Mexico and Central America. They have bowl shaped, pale yellow to creamy-white flowers borne singly or in clusters in the leaf axils. Cleyera japonica (syn. C. fortunei) is the most widely cultivated species. It is native from Burma, China, Korea and Japan and is hardy zone 8 to 11. Its cultivar ‘Tricolor’ has young leaves tinged pink, maturing to green with a creamy white border. There are about 85 species in the genus Ternstroemia. They are evergreen trees and shrubs in mainly tropical regions of Asia, Africa, North and South America. T. gymnanthera (syn. T. japonica) is the species most frequently encountered in gardens. It is native to China, Taiwan and Burma. There are a number of cultivars of this species with variously colored foliage. Eurya claims about 70 species of, and as with the previous two genera, primarily evergreen trees and shrubs. Members of this genus occur in East and Southeast Asia and the Pacific Islands. Eurya emarginata and E. japonica are occasionally grown.